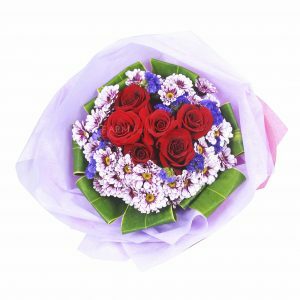 A beautiful bouquet consisting of 1 rose, some baby’s breath, and a couple of purple statice, wrapped with tender loving care to ensure a smile on the face of your recipient! Contact us for discount on bulk orders. Value for money bouquet. Happy with the buy. Cheap and good bouquet with free delivery 😀 Can’t complain!